In addition, it informs them from LikeA of the new work. As for the half denim, man and woman's parts are different. Therefore, it's separate sales respectively. Color change can be done three colors of the belt. It's possible to cooperate with the tank top put on the market simultaneously with this. 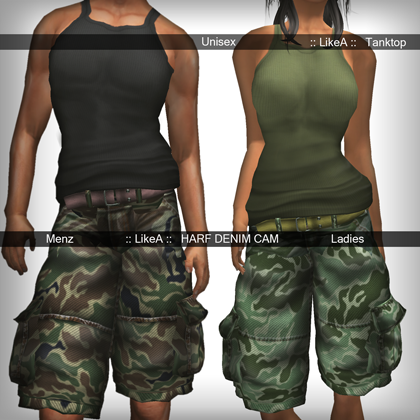 Color change or turning off the skirt of the tank top can be chosen. Four parts are wear. And, there is a resize script include, and it's possible to adjust it. The tank top is a normal pattern. There are five colors. There is cooperation with the half denim, too. It's the best of this season (summer) and recommended.